There is some more explicit romance going on in this episode mixed in with flashback and more artmaking. The romance is less convincing than the reflections about how artists begin their journeys. Miyako simply barges into Hiro’s life with little motivation, warning, and is already coming to his house unbidden and cooking for him. It’s too much too soon and feels unearned to me, though I wouldn’t be surprised if it was one of those deals where they really did know each other from way back, but through amnesia, trauma, or repression, have forgotten. (Gee, like we haven’t seen that in anime before!) The concluding scenes with Renji and Chihiro were also, well, melodramatic. A bit too much flailing and angsting even for my taste, and her extreme reaction to Renji’s suggestion that they write something together (something I predicted would happen) felt illogical. 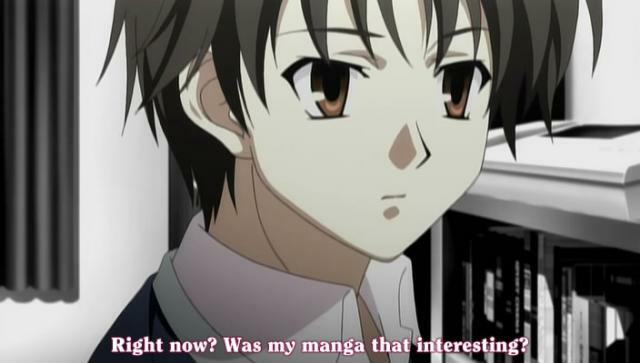 And I’m a guy who got started because he loved Evangelion. 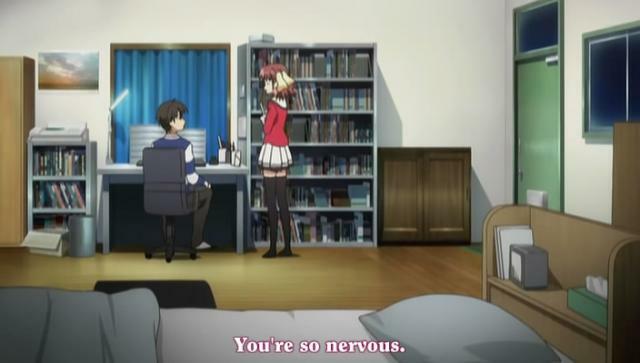 But boy, that nervousness when Miyako teases Hiro about what she thinks about his one-shot manga chapter: I’ve been there. The encouragement to start creating because others have praised you for it: I’ve been there too. (I started writing because a fifth grade teacher liked a story I wrote for some random assignment. Teacher praise kept me going for the first 3 years or so.) This applies as much to cooking, it seems for Kei, as much as it does for Hiro and, apparently, Chihiro, who needs a little more coaxing before she stops reacting so emo to the very idea of even writing a novel. I am not sure, though, that an entire novel could be written about a single person left alone in the world. A short story, maybe, or a Twilight Zone episode, but an entire novel? And what’s Renji’s track record as a writer anyway? Does this guy know how much sheer grit and discipline are required to even get through the writing of a crappy novel? 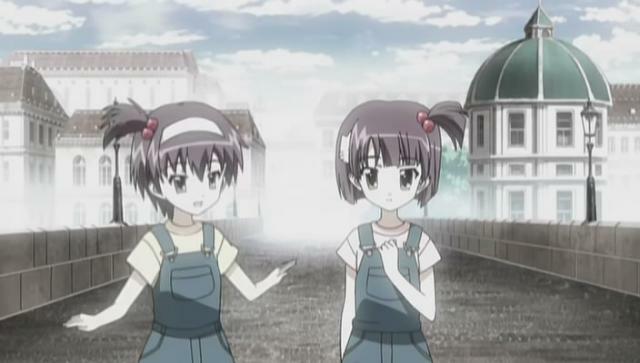 Finally, we see some brief flashbacks with an able-bodied Chihiro and Kei as identical twins playing with a young Hiro. I’m interested in the way Chihiro and Kei’s lives will somehow parallel with each other, as I’m sure it will; given the artistic choices made by the director in this show and the fact that Shinbo has clearly learned a thing or two from Anno, that’s almost certain to happen. This is a show that clearly wants to be more. 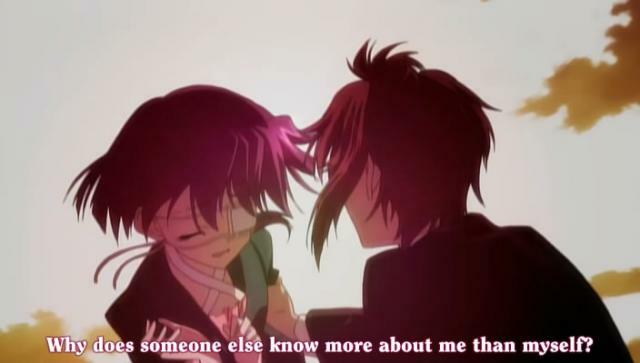 As an anime romance, it’s average, cliched even. 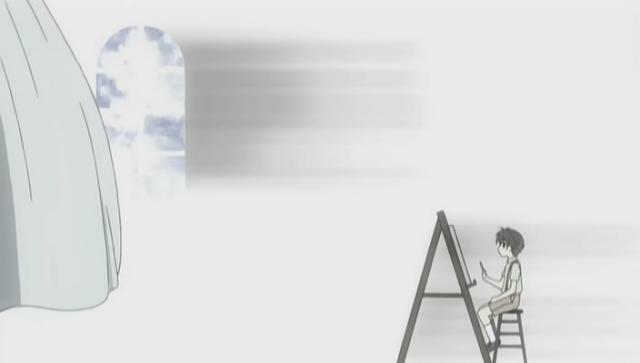 It’s mostly interesting to me as a tale about artists, and it’s more explicitly about the life of creating than was Honey and Clover, whose characters were all art students but where the central concerns were about life and love in general. We actually start to get a sense of why these people became creators, and the obstacles they face in trying to create, from carpal tunnel to amnesia and insecurity. It’s a rather idealized portrait of artists, to be sure. 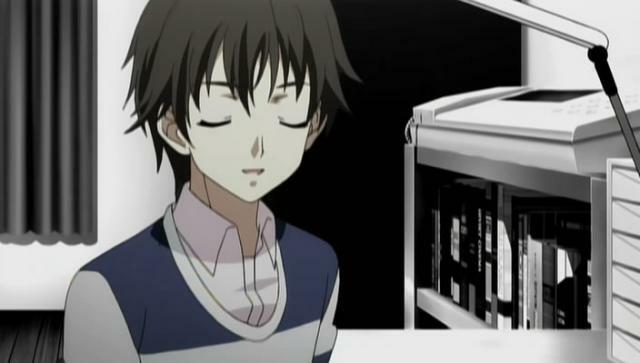 The fate of Satou in Welcome to the NHK! is a lot more typical of those who vow to become “creators.” We haven’t seen as much of the grunt work yet that 90% of it actually is. 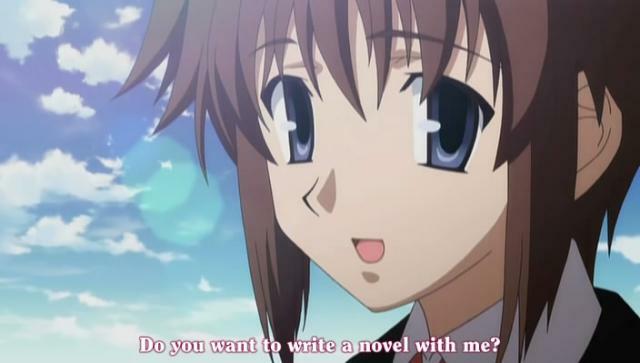 I wonder if the game makers of ef were aiming at a particular kind of otaku when they concocted this story. Perhaps they were trying to especially reach geeks like me, ones with pretensions to artistry and with an open skepticism about ren’ai games in general…game fans, did the Shinbo-isms come from the game itself, or is that unique to the anime? I’m not sure the story works nearly as well without the stylistic flourishes, which really reinforce the themes of the story in ways that otherwise can’t be done. Previous PostClannad 4–Tomoya’s Lucky StarNext PostRingtone from Genshiken S2 – Gundam Seed Cliche music done OK.
You can be a great director or great writer, but you can’t fight the source material. 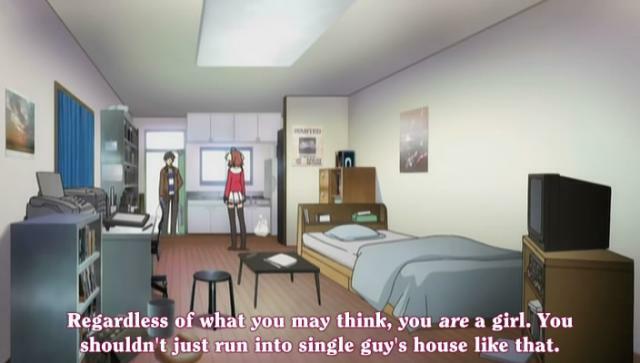 ….Well, you can, but a lot of people would probably get pissed…especially in the anime/game otaku world. With that said, I think ef goes as far as it can, and well.